Belarus President Alexander Lukashenko undressed Zimbabwe president during his visit to the country. Lukashenko told Mnangwagwa to take off his scarf, an accidental fashion accessory that has been helping Zimbabwe’s new president rebrand the country – and distance himself from his predecessor Robert Mugabe and his 37-year rule. The President remarked that the sides know each other’s capabilities very well, but there are certain difficulties in the development of relations. “Only those who do not try to overcome these difficulties will fail. If we set a goal to overcome these difficulties in the relations between our states, we will definitely implement projects which we can see today,” the Belarusian leader is convinced. Emmerson Mnangagwa, in turn, said that Belarus and Zimbabwe maintain very close and good relations. He remarked that Zimbabwe is facing difficult times. For more than two decades the country has been struggling with various economic sanctions, the country has virtually been isolated. The President of Zimbabwe thanked Alexander Lukashenko for the warm welcome and for the support of his country in this difficult times. During the talks in the extended format the Belarusian head of state said that Belarus wants to gradually advance to the strategic level of cooperation with Zimbabwe and sees a big potential for the development of bilateral relations. “Zimbabwe is Belarus’ important partner in the region of Southern Africa, and we want to gradually advance to the highest strategic level of cooperation. The relations between the countries are increasingly vibrant right now. However, there is still a big untapped potential for interaction. We will need to step up efforts, especially in trade and economy, in the coming years,” the head of state said. The President is convinced that Zimbabwe has all tools for the rapid economic growth and resolution of pending issues concerning the wellbeing of people. “Belarusians are ready to help you. And you know that we can do it,” Alexander Lukashenko remarked. Belarus is interested in the delivery of freight vehicles and buses, other equipment for the mining industry, tractors, foodstuffs to the Zimbabwean market. The Belarusian side is ready to discuss the prospects of Belarus’ participation in joint projects in agriculture, construction, energy sector, geological survey, mining. In 2018 several multi-million-dollar agreements were concluded to export Belarusian equipment to Zimbabwe with the financial assistance of the Development Bank of the Republic of Belarus and the Reserve Bank of Zimbabwe. It is expected that the deliveries will start after the harmonization of all procedures in accordance with these agreements. According to the Belarusian President, projects to build meat and dairy factories, vegetable growing and processing facilities can make a significant contribution to strengthening of bilateral relations. The sides also outlined the prospects of cooperation in the transport sector. This pertains to the development of Zimbabwe’s transport infrastructure and setting up a transport and logistics center there. “Unique landscape and natural, mineral and recreational resources of Zimbabwe also offer broad opportunities for our cooperation. Therefore, Belarusian companies can take part in the erection of hydroenergy facilities, turn-key construction of solar power stations, geological survey and mining of natural resources,” the Belarusian head of state said. He mentioned active development of humanitarian cooperation. The sides concluded agreements on student exchange, higher education opportunities for Zimbabwean people in Belarus. Besides, leading healthcare organizations of Belarus can provide high-quality medical aid to Zimbabwean citizens. “Our achievements in neurosurgery, orthopedics, cardiology, oncology, transplantology, medical rehabilitation are well known abroad,” Alexander Lukashenko remarked. The head of state believes that the formation of the Belarusian-Zimbabwean intergovernmental commission for trade and economic cooperation could stimulate the fulfillment of plans. He noted that direct contacts and good communication between ministries, organizations and companies are needed to facilitate the implementation of investment and joint projects. “We should pay maximum attention to the proposals of both sides. This is the only way to fulfill our plans,” the head of state believes. Alexander Lukashenko added that business circles, associations of businessmen, chambers of commerce and industry of the two states should also become important elements in the development of new joint projects. “Belarus is open for dialogue on all topics of interest. We are prepared to the comprehensive discussion of our interaction, the ways to increase bilateral trade and expand mutually beneficial partnership. I want to emphasize that there are no closed topics in cooperation with Zimbabwe for Belarus,” the President concluded. After the talks the sides signed a number of bilateral documents. 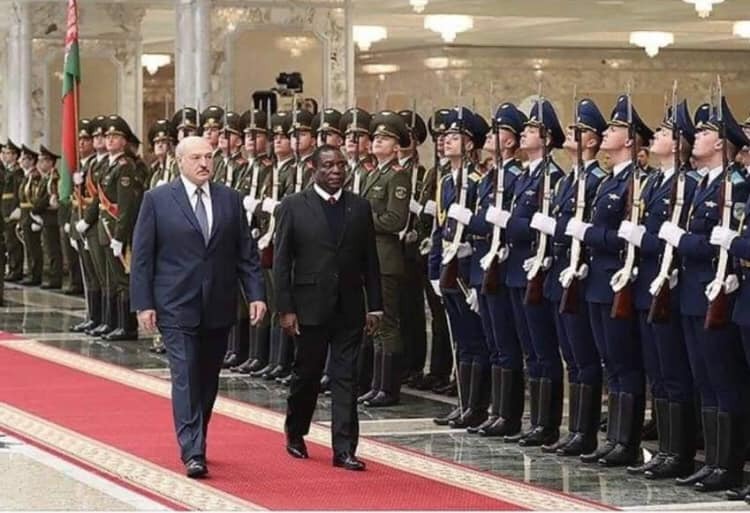 According to Alexander Lukashenko, the main avenues of developing Belarus-Zimbabwe relations were discussed as well as prospects of advancing them to new heights. “Belarus views Zimbabwe as an important partner in the South Africa region. Relations between the two countries can be described as friendly and mutually beneficial,” noted the Belarusian leader. 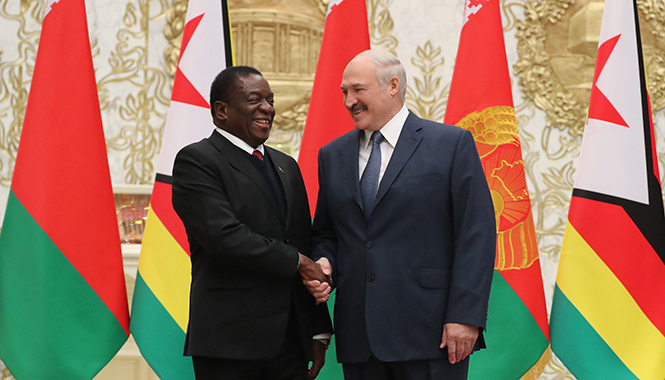 Alexander Lukashenko stated that Belarus and Zimbabwe intend to move on and secure more up-to-date and versatile economic relations instead of simple trade. With this in mind the sides discussed prospects of implementing investment projects and joint projects in Zimbabwe in the spheres of agriculture, civil engineering, transport infrastructure, power engineering, geological exploration, and the extraction of natural resources. Alexander Lukashenko also counts on expanding Belarus-Zimbabwe relations in the area of the private sector, with long-term mutually beneficial contacts established. The head of state believes it is necessary to establish and maintain steady business ties between the chambers of commerce and industry and the associations of business circles. 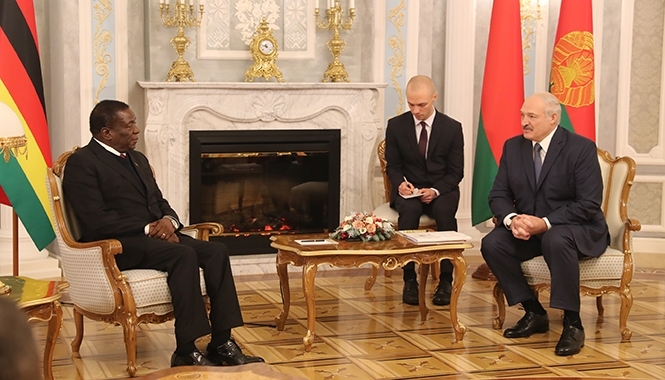 Alexander Lukashenko described the potential for Belarus-Zimbabwe cooperation as huge. “Certainly, Zimbabwe is living through a complicated period now. It has to deal with things. This is why I wished decisive actions to overcome problems to the President and to the delegation. I wished patience and courage to the industrious Zimbabwean nation. All countries and nations have had to deal with hardships and trials,” he said. Alexander Lukashenko also said he hopes that Zimbabwe will be able to accomplish the necessary changes within a short period of time. “You are on the right track. Friends are very important on this track as the president said. You can rest assured that Belarus is your reliable friend and helper,” he said.